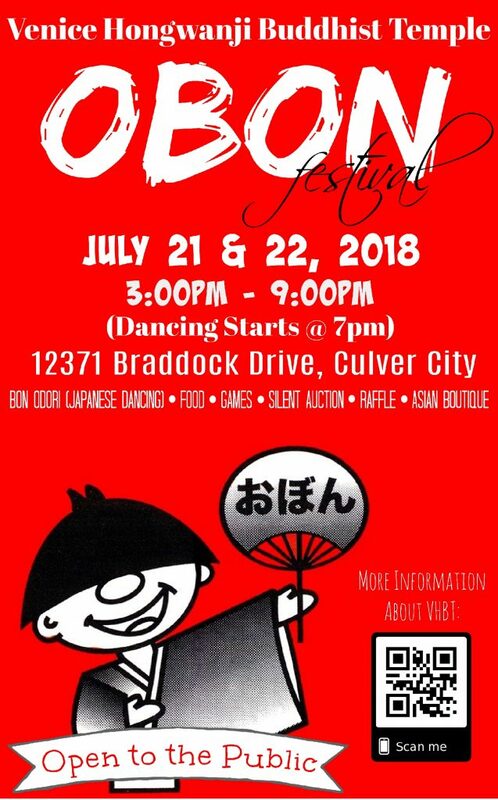 The VHBT Obon Festival will take place over the weekend of July 21-22, from 3PM-9PM. Come sample our teriyaki chicken bowl, vegetarian curry, chili dogs and chili rice, salad, spam musubi, and dangos for dessert. Odori (dancing) will run from 7:00PM-8:30PM on both evenings. We express our gratitude and appreciation to the individuals, families and businesses who are sponsors of the 2018 Obon Festival for VHBT. All practices will be held from 7:00PM-8:30PM. Our silent auction is now open and taking bids. We are once again using 32 Auctions as our auction platform, so if you have an account from last year, it’s still good this year. All times PM except for the start of the Las Vegas obon, which is 11:00 AM, and San Diego obon, which will start at 10:00AM. *San Diego Obon will be held @ Balboa Park. The VHBT Obon Festival will take place over the weekend of July 21-22, from 3PM-9PM. Odori practice begins Wednesday, June 27, from 7:00PM - 8:30PM.